Bangkok’s Songkran Festival is an event where boisterous fun and ancient traditions go hand-in-hand. Many of our investor friends, some who have bought properties and moved abroad to Thailand, have even experienced this cultural-rich celebration. For tourists, the event offers a chance to enjoy a huge celebration where water parties crowd around Bangkok’s major streets. Bangkok’s Songkran Festival is an event where boisterous fun and ancient traditions go hand-in-hand. For locals, it is a time when they can spend precious moments with their families and visit temples to observe ancient rites and make merit. Water is an important element of Songkran, especially in more recent times when the throwing of water has become a huge part of the annual celebrations. If you’re visiting Thailand during this period, prepare to get splashed! Bangkok’s Songkran celebrations are praised worldwide. Crowds of people roam around throwing buckets of water, using water pistols and just generally soaking anyone in the vicinity. Appreciation of family is another important aspect of the festival, with many Thai people making their way to their hometowns to spend time with older relatives. Buddhists also visit temples throughout Songkran where water is poured on Buddha images and on the hands of Buddhist monks as a mark of respect. 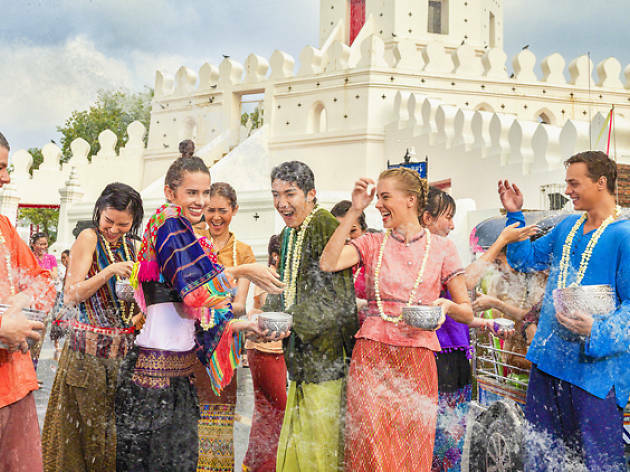 A time of tradition, Songkran is also a time of fun with family and friends, and Siam Songkran is set to blend Thai and Western cultures with a packed music and entertainment program and the largest water fight in Bangkok. 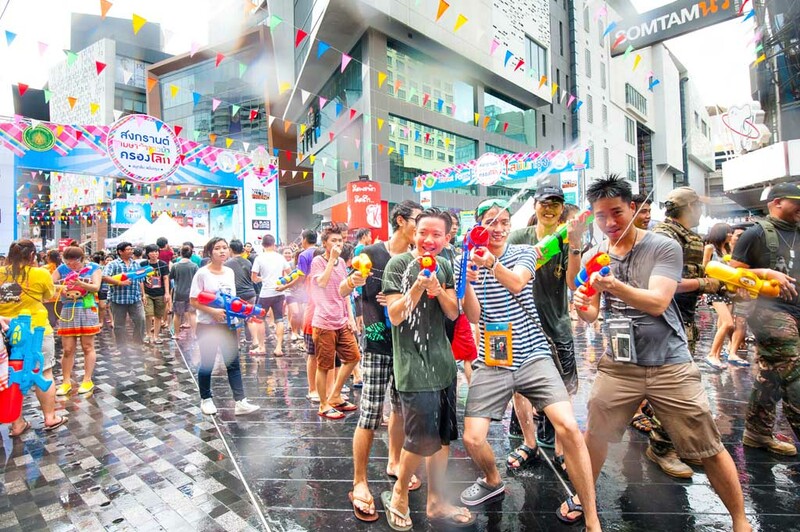 Bangkok’s Songkran water fights will take place on Khao San Road and Silom Road with over 5 kilometers of party area for foreigners and tourists. If visitors want to stay away from the water, the BTS footbridge above would be a good idea, as water fights are not permitted on the bridge. You can also watch the spectacular water fight from the bridge without getting splashed at! Last year the King Power Mahanakhon Tower was opened for spectators, this year it will be opened for visitors to watch the city and the Silom Light Show from the 78th floor’s glass floor. The newly opened ICONSIAM shopping center will celebrate the festival with dance and water shows that can also be viewed from the river. More than 500 international and local brands will have their sales at ICONSIAM. Getting soaked is inevitable when you are on the battlefields of Songkran hence it is important that you dress up accordingly. Make sure you don’t dress up in whites unless you are prepared for it to become see-through once it gets wet. Putting on a swimsuit underneath is a great idea in case you want to maintain the dignity once an elephant pressure-hoses you. if you are planning to get into the action, put all your valuables and electronics in a waterproof bag. A plastic waterproof pouch or a Ziploc will be just fine. Make sure you hide your bag inside your shirt or get it buttoned in case it is possible.